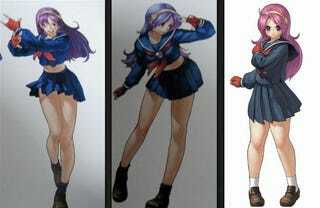 One of the biggest character changes for The King of Fighters XII is schoolgirl fighter Athena. It's like she's another person altogether. While making the game, SNK illustrator Eisuke Ogura says that the director obviously kept giving the team feedback. According to Ogura, Athena's character design is drastically most different. When they started to draw her, they kept getting comments like, "She let her smile!" or "Make her legs fatter!" or simply "Fatter!" And Ogura said they revised her character design many times over until the design that appears in KOF12 was reached. At least they didn't change her loafers!